By cupcakeSerenity on October 19th, 2010 . 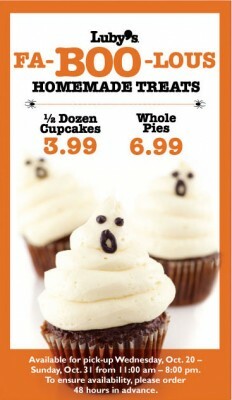 Filed under: Bakeries, Halloween . A half-dozen homemade cupcakes costs $3.99. The cupcakes are available in double chocolate and yellow cake with vanilla cream frosting. Luby’s promises “spooky accents.” Orders need to be placed 48 hours in advance. “Luby’s gourmet cupcakes are the best in Texas,” said Chris Pappas, CEO of Luby’s, Inc.
You can also visit Luby’s on Facebook. they are cool those ghosts! I will make them!